Participants at the BYMC 2018. The websites for previous editions of the BYMC: (2015), (2016) and (2018). The aim of this colloquium is to consolidate the network among early career researchers and postgraduate students from all across the country, especially in the branches of mathematics studied in our school — algebra, analysis, combinatorics, applied mathematics and optimisation. The event will be divided into two parallel sessions (pure maths, and applied maths and optimisation), each of them with plenary talks and short postgraduate talks spread throughout the day. Postgraduate students working in any field of mathematics are encouraged to submit an abstract for a short talk (20 minutes + questions). This includes students from the UK as well as abroad. The submission deadline is the 15th of March. Guidelines for abstract submission: Please send the title and abstract for your talk as either a TeX file or, if there are no formulas or mathematical symbols, in the body of your email. Please try to limit your abstract to 1000 characters or less. Literature references will not be included in the book of abstracts. Send submissions to bymc@contacts.bham.ac.uk. We will let you know whether your talk has been accepted within a week of the submission deadline. Click here for the list of all registered participants. Polygonal meshes: a new frontier for finite element methods? Conference dinner in the evening (19:00). The schedule for the contributed talks and the book of abstracts can be found here. Registration closed at 5pm on Friday, 29th March 2019. If you are an international researcher not based in Birmingham, you will need to inform the University of Birmingham of your visit. This applies to everyone who does not hold a UK passport. To do so, please follow this link and fill out the form. The "name of person who invited you" should be "Alexander Brune". If you require a visa to travel to the UK, please make sure that this visa allows you to attend conferences. If you do not have the appropriate type of visa, you will not be able to attend the conference. For students from universities in the MAGIC group, limited funding is available to cover travel, subsistence and, if required, accommodation. Participants will be able to claim reimbursement for their expenses following the conference. No application is required. The colloquium will take place at the University of Birmingham, about 2 miles away from the city centre. Directions to the university can be found on its main website here. 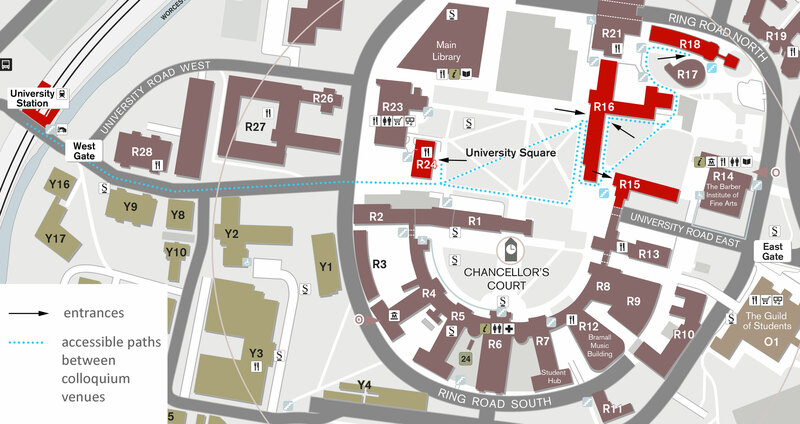 The School of Mathematics is based in Watson Building (R15 on the map). Annotated Campus Map. Click for a full resolution version. Participants are invited to make their own accommodation arrangements. We list a few possible alternatives. We are working to make the Young Mathematicians Colloquium accessible to everyone. All lecture theatres as well as the Mason Lounge are on ground level. Infra-red hearing assistance systems are installed in the lecture theatres. Please inform us ahead of time if you would like to use these and we will supply you with an infra-red receiver on the day of the conference. on AccessAble.co.uk . Note that the above websites falsely state that there is not a hearing assistance system installed. Please see the annotated campus map for accessible paths between the buildings. There is also a Campus mobility map which highlights disabled parking. If you have any questions or requirements not addressed here, please don’t hesitate to get in touch with us. 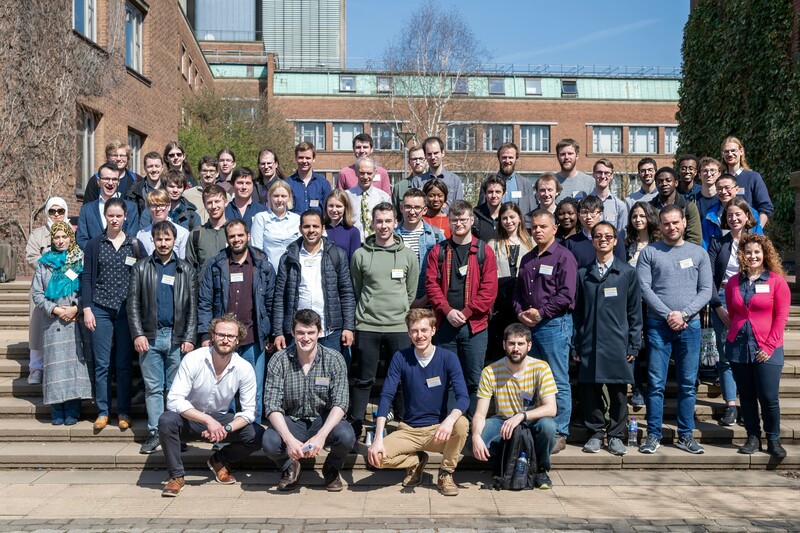 The BYMC 2019 wouldn't be possible without the support of the MAGIC network and the School of Mathematics, University of Birmingham. © 2019 BYMC. All rights reserved.